If you build boxes at all, eventually you tire of cranking your blade from 90 degrees to 45 degrees and back…I did. So I built this simple jig, and now I can cut all 8 ends of a box accurately in about 5 minutes, AND STILL LEAVE MY TABLE SAW SET AT 90 DEGREES. Assumption: I am assuming that you have already laid out the board for your sides and have cut all four sides of your box to length. Short side, long side, short side, long side and have cut a dado slot in these boards that will accept the bottom board of your finished box. 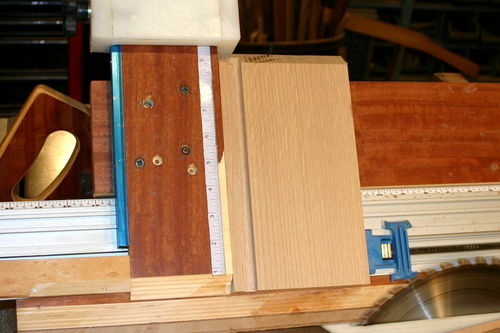 (above) The key to efficiency is this jig. It is designed to hold the box side on a 45 degree angle. It has an adjustable stop running vertically in a track, and a clamp to hold it while you run it across the blade. Used properly, your hands will be well out of the way while this is happening. IT IS IMPERATIVE THAT YOU WEAR EYE PROTECTION WHEN YOU USE THIS JIG. THE SMALL CUT OFF FROM THE DADO GROOVE CAN REALLY FLY AROUND THE SHOP. (above) To operate the jig, put the bottom dado cut up and clamp the box side in the jig. Feel under the clamped side to see that just a little of the bottom edge of the board extends just beyond the blade-side part of the jig. Now, BRING THE SLIDING STOP DOWN TO CONTACT THE TOP EDGE OF THE CLAMPED SIDE AND LOCK THE STOP. The stop is the white plastic piece with the knob in the sliding track. 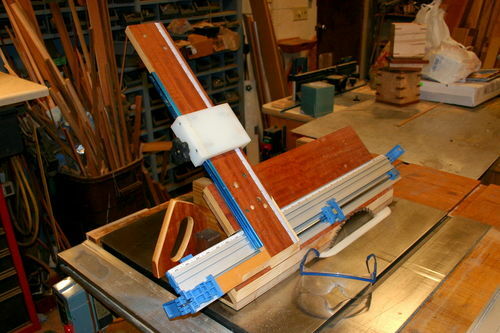 Use the clamp lever to be sure the box side is firmly clamped and seated properly in the jig. 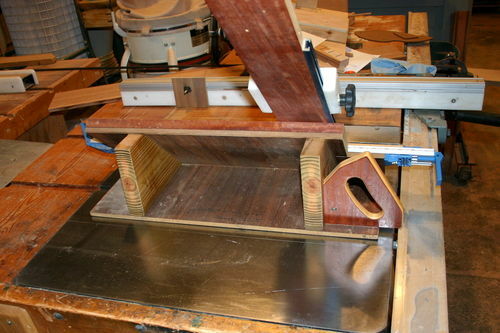 Now use the jig to slide the jig and board over the saw blade. KEEP YOUR HANDS WELL INSIDE AND TO THE BACK OF THE JIG. USE THE HANDLE. 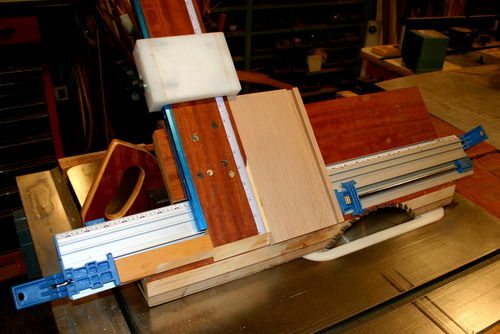 (above) Now slide the jig well back on your table saw so the board is well back and out of the way of the blade. To be safe turn off the saw. Release the clamp, spin the side around and put the newly cut edge against the stop. Then cut the opposite end too. (above) This shows the two ends cut. IMPORTANT: DON’T MOVE THE STOP. WHILE YOU HAVE THIS SETTING, CUT THE OPPOSING SIDE OF THE BOX…NOW BOTH OPPOSING SIDES WILL BE IDENTICAL IN LENGTH. 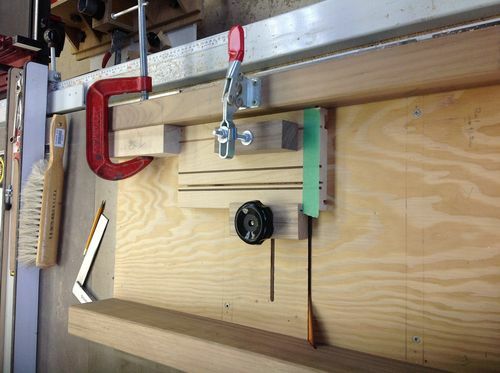 If you are making a square box leave the stop in place and cut the next two sides. If it is oblong, reset the stop for the next two sides and cut them. (above) This shot shows the bottom of the jig. It runs on a single guide. I prefer UHMW (ultra high molecular weight) plastic for runners. These guides don’t swell or shrink and are self lubricating. If you let the guide extend a bit beyond the back of the jig it makes it easy to align the guide with the table saw slot. (above) This is not a great shot, but you can see the clamping board is supported by an angle cut 2×6. While I used a dual clamp modified to hold the clamp in the the jig with one side, and the box side to be cut is clamped on the other side, you could use a simple clamp to hold the box side and screw it securely to fasten it to the jig. (above) I have found that having the saw-side edge elevated about an inch above the table allows the cut of edges to drop in the center of the blade and the cutoffs are less likely to be thrown by a moving blade. A ZERO CLEARANCE INSERT IS A MUST SO THE SMALL CUT OFFS DON’T GET WEDGED BETWEEN A MOVING BLADE AND THE INSERT. Recess your clamp so it is even with the angled top of the jig. Be careful not to let the angled edge of the cut and spun board slip under your stop. If I build another of these, I’ll put a dado and a finger on the stop to prevent the angled side from slipping under the stop. Design your stop so it stays square to the vertical track. In practice this jig is quick and easy to use and the build is not really complex. It saves me a ton of time. Wow, that’s quite an impressive invention for 45 deg corners. It looks to be sturdy and well used. Here’s a picture of the one I use for my 45 deg box corners. Thanks for posting this. I have been trying to figure out how to do something similar to this for a while. Will it accommodate different thicknesses of wood or does the angled bed need adjusting each time to take the wood closer to or further away from the blade? Boxguy and CalgaryGeoff, like each jig. 45 from a 90 blade and a 45 blade. Any more jig posts out there? 104 days I am a member. New to LJ and NEW to woodworking. Read LJ one and two times a day every day. Learning something every day. on here and believe me we learn from each and every one of you. Thank you, all, even the simplest things. From my shoes it is a whole new world. 1. Which jig clamp system is that you are using? 2. What is the difference if any dado on the bottom opposed to a .45 mitered bottom? Simple…, yes, but with the sophistication of the Projects you build with it. 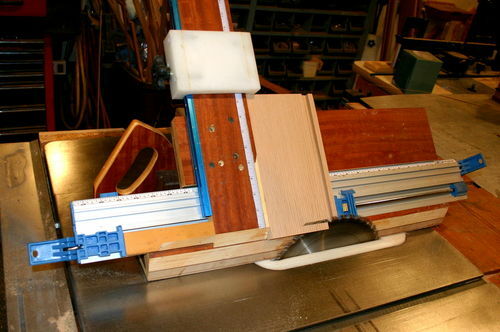 That Jig has so many additional miter uses, we should have one hanging next to our Crosscut Sleds. ...I need to go shopping for some of that hardware today. Well done and a big LJs’ “Thank You” for sharing. Randy, I think this is an All-In-One clamp, but honestly any of the similar straight edge clamps will do. Remember you need them to fit flush on the jig’s top surface. This brand is a little thinner than most. I think a 45 bottom is very difficult to do and get a nice fit. With a dado groove bottom it is easy and has a good deal of forgiveness in the fit. I’ll do a tutorial some time on fitting in the bottom. It is not hard if you use the right process. A 45 relies on glue, the dado groove version is mechanical and can float. The only way I have found to get a good fit on the 45 is to run the edge across a router bit to get a crisp 45 on both faces…then everything has to fit up tightly and the fit is tough. With a groove all of that is easy and the solid wood bottoms can float. Ah ok great, thanks for that explanation. I’ve done kitchen cabinet drawers so I’m thinking it’s the same process on these boxes. Side Note I just got back from local woodcraft and bought the forrest only instead of a grind 2 I bought a grind 1. No wonder yer the “Box-Guy”. This helps splain it. Hey Box-guy; thanks a bunch for this posting. I am about 4 years into box building, and find something new everyday. I really appreciate your approach to this process, as I have tried just about every approach to this I can think of, and your post turned on a light. I currently have a jessem sliding table on my saw, and use a clamp on the miter attachment to cut the sides, which are held on edge. This works great on narrow sides, but doesn’t work on wider sides. Sooooo looks like I’ll be building me a jig similar to what you have shown here. thanks again for your willingness to share! I have some of my stuff posted on my website: www.clarkco-boxes.com; If you’re interested take a gander at some of my attempts at boxes. Boxguy, thanks for posting this project and thanks for linking to it in your current project. I’ve only been on LJ a few months and had not seen this. I’ll be building one of these. Favorited! Any insights on how to get the jig angle exactly 45 degrees? If the slightest bit off it is a problem. I built another jig for this type operation and somehow got it off a bit. Quite frustrating. Kevin, I cut the supporting 2×8 on the miter saw and used half of each cut for the mounts. I think it is important to screw the parts together so you don’t get too much slack in the joints. I also blow off the table saw and the jig each time I use it. 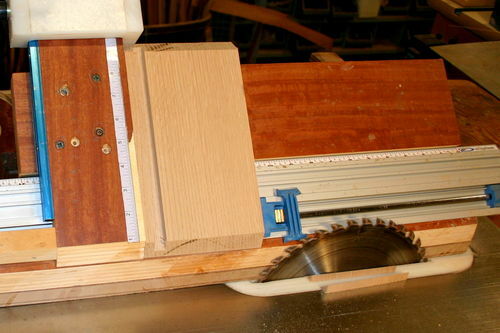 A little sawdust on the table or in the miter gauge slot can throw off your cut. 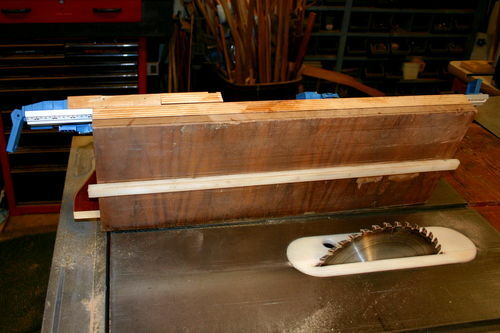 It is also important to give the jig a wide base so it will be stable as you cut. Well, that certainly is a complicated solution to a very simple problem. $29 gets you a Beall or Wixley angle gauge. Put magnetic gauge onto blade and press button to zero out. Adjust blade until gauge reads 45deg. Your jig is only as accurate as the person building it. The angle gauge is perfect every time, is cheaper and doesn’t take any time to build. I have a really old saw where the table adjusts rather than the blade for angled cuts. Very clumsy plus I extended the table to cut larger sheet goods so now it is nearly impossible to do angled cuts so something like this would be really helpful. Outstanding and very useful jig you have here Box Guy. Think one of my biggest issues in the shop is a solid dead on 45 for my boxes. May have to try my hands at one of these jewels for my shop… Thanks for sharing you handy work….